You'll be £30.00 closer to your next £10.00 credit when you purchase Eric Bottomley's Transport Gallery. What's this? 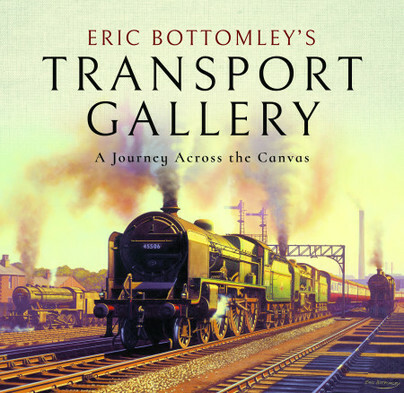 This is Eric Bottomley's second art book, in which he has varied both his transport themes and the mediums in which he works. The majority of paintings are in oils but also included are gouache (watercolour) and pencil sketches. However, some paintings are both gouache and pencil, together known as mixed media. Railways have always been a great passion of Eric's, from trainspotting around the ex-Lancashire & Yorkshire system as a boy, to painting commisions for customers both private and commercial. From his lowly studio in Wimborne, Dorset, where his painting career took off, Eric never envisaged that one day he would witness his paintings being presented to the Duke of Kent, or that he would meet the Duke of Gloucester (a fellow railway enthusiast). In 1979 he joined the Guild of Railway Artists, and later became a full member. Included in this book are all four regions of Britain's railway, but mostly the BR period from 1948, to the end of steam in 1968. Added to this are such scenes as the Trans-Siberian Express in Moscow, The Golfers Express leaving Belfast and preserved diesels in the USA. The sad demise of steam and dereliction of the canals in the 1960s, and the amazing restoration projects over the years, has provided Eric with an enormous scope of subject matter, much of which is captured in this compelling book. A well known railway artist offers a compilation of many paintings that will appeal to many readers. Eric Bottomley is a master of the much overlooked art of illustration and the best are superb. You can almost smell the coal smoke in my favourite depiction of a Dukedog beside the River Dee. They aren’t all railway scenes: there is a cracking view of Bristol trams plus others of vintage cars and aircraft. Ideal for the engineer’s Christmas stocking, or perhaps his pillow case. This book covers a wide variety of forms of transport, although it features predominantly railway related subjects. The author also includes some interesting details about the materials he uses and the process of producing the finished picture. It provides a very comprehensive trip through a wide variety of locations, both British and overseas, and the paintings show an incredible amount of detail in the subject matter and its context in place and time. This nostalgic journey is beautifully illustrated and accompanied by notes from the artist. This is Eric Bottomley's second art book, in which he has varied both his transport themes and the mediums in which he works. The majority of paintings are in oils but also included are gouache, mixed media and pencil sketches. All four regions of Britain’s railways are covered, mostly of the BR period from 1948 to the end of steam in 1968. There are some lovely Welsh scenes including Abercynon shed, Hindlip Hall at Gobowen, the Vale of Rheidol Railway (with No 3 Talybont), the Corris Railway, a 43xx near Barmouth, Llanfyllin Station, the Tanat Valley, Bala Station, the Talyllyn in the snow and my personal favourite and the star of your Christmas Newsletter cover, Talybont on Usk in the snow). Golfers Express leaving Belfast and preserved diesels in the USA. The demise of steam and the dereliction to be found on canals in the 1960's, provided Eric with an enormous scope of subject matter, much of which is captured in this delightful book. Eric Bottomley was born in Oldham in 1948. He studied art and crafts at the Oldham School of Art, leaving in 1964 to pursue a career in commercial art. As a freelance artist and illustrator, he specialised in industrial and transport subjects. He set up a studio in Wimborne Minster and later, in 1979, became a member of the Guild of Railway Artists. In the 1980s, Eric moved to Much Marcle, Herefordshire, where he often painted the local scene and its industries. Eric has covered most forms of transport, producing work for private commissions and corporate customers. He now lives in South Devon, where he continues to paint and pursue his other great railway passion, that of modelling the railways and industrial scene of his youth, in 0 Gauge.